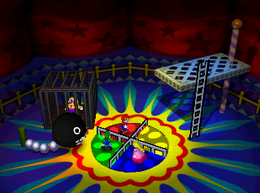 Merry-Go-Chomp is a battle minigame found in Mario Party 3. Its name is a pun on a Merry-Go-Round. This minigame plays similar to Bowser's Big Blast from Mario Party 2, with players choosing a color and getting eliminated one by one. The four players start in a line, and one by one have to pick a color panel on top of a spinning pillar to stay on. After all the players have chosen a color, the pillar will start spinning faster and descend towards a Chain Chomp. The pillar will then slow down until it stops. The Chain Chomp will then take a player the pillar stops on and lock them in a cage, thus eliminating them from the game and making them lose. If the Chain Chomp is next to an empty color panel when the pillar stops, the pillar will start spinning and stopping again until the Chain Chomp gets a player. After a player is chosen, the remaining players will climb up a ladder and reassemble themselves in a line, where they will then choose another color panel. The cycle repeats until there is one player remaining, who wins the game. Game Rules – "Below the spinning pillar, the Chain Chomp waits for you! Try your luck--pick a color to avoid the Chain Chomp!" Advice – "No one knows which color will stop in front of the Chain Chomp! Choose one that feels lucky!" This page was last edited on May 22, 2017, at 02:33.